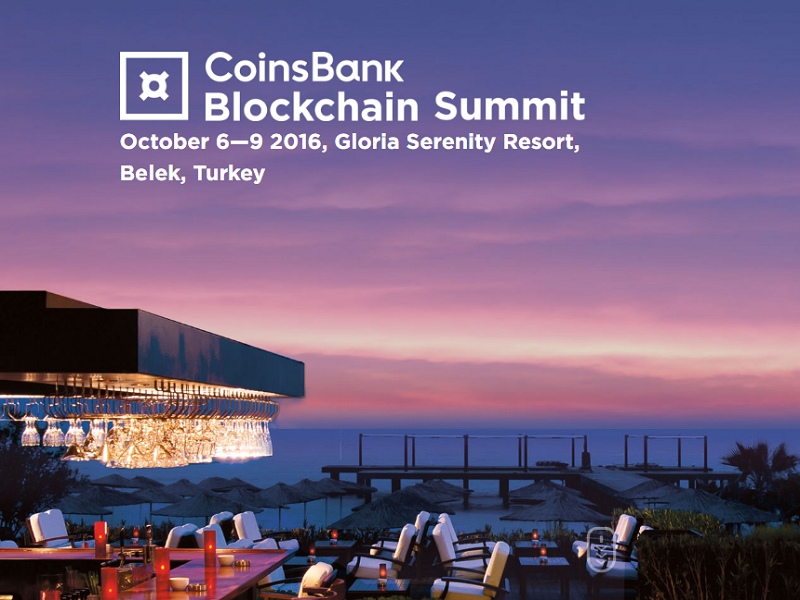 The beautiful setting of the Mediterranean Sea on the Turkish Riviera welcomed some of the brightest minds in blockchain to the Coinsbank Summit. These industry leaders made major announcements, including a new gaming platform that utilizes expanded capabilities and in-game integration for cryptocurrency. Also read: Industry Report: Is the End of Bitcoin Near? When Ronny Boesing, CEO of Coinsbank, decided to have a “Blockchain Party” of some of the brightest minds in the blockchain industry, he wanted to do it in the comfort and beauty of a place where these people could share, think and network together. This international roster came together last week (October 6-9, 2016) in Belek, Turkey and I was fortunate enough to be part of this group, and heard some big announcements from this formidable roster of blockchain thinkers and doers. The “party” was organized by Coinsbank, which continues to grow at a feverish pace into what Boesing calls, “the new bank on the block.” It’s clear that Coinsbank is not just interested in being a typical bitcoin wallet company, but is instead focused on offering many banking services to its customers worldwide. These services include not only a “new type of safe wallet with multi-signature hardware,” as Boesing calls it, but will provide lending services from the cryptocurrency holdings in clients’ wallets. Other speakers attended, including Nick Ayton from SmartLedger Labs. Ayton discussed his approach to implementing blockchain based solutions for financial institutions, where he feels innovation in this area can significantly change existing processes models and create large savings. He particularly sees an opportunity to disrupt and improve the model for insurance product processes and pricing with blockchain technology. Marco Streng, CEO of Genesis Mining, gave a well-detailed update on the state of crypto mining. Streng’s company has been a leader in the area of involving individual investors to financially benefit from mining operations. He also discussed his new offering, called the Logos Fund, which has been registered with the SEC and is available for appropriate investors (minimum of $25,000). Sergey Sholom, CEO of Datcroft, a leading gaming company gave a detailed presentation on the state of the gaming industry today. Some of these issues involve the severe limitations that developers face including on-ramping of their funds, the severe revenue surcharges from Google and Apple to developers and a generally highly competitive environment that suppresses monetization. Along with Nebojša Maksimović (call him Nele), Chairman of GameCredits, Sholom made a significant announcement that their joint company will integrate the cryptocurrency GAME into the fabric of games to address these issues. Sholom pointed out that the intent was not to provide just another use of cryptocurrencies, but to ultimately provide a solution to the gaming industry that is truly different and unique in the industry, which is projected to hit over $100 billion of revenue next year. Both saw this as a way to integrate the growing world of cryptocurrencies with a successful and growing base of games (Sholom’s company, Datcroft has over 10 million players) that will create a platform that benefits both gamers and developers. They were very excited about the opportunity for this to not only expand the utility of the GAME coin (which has been around for a few years) but to provide an opportunity for gamers and developers to recognize the benefits of cryptocurrency as a way to build wealth and show their ability to provide a better experience for everyone. The growth of Coinsbank continues and next year they plan on having the next CoinsBank Blockchain Party on a cruise ship in a body of water to be named later, in May, 2017. Boesing hopes to see more leading Blockchain movers and shakers at that one, including any who may have missed this year’s festivities. What do you think? How can cryptocurrencies help the gaming industry? Images courtesy of Coinsbank, International Bellhop.